FILE - A store employee speaks to a customer about the purchase of a 9 mm handgun in Bridgeton, Missouri, Nov. 13, 2014. The NRA, which claims 5 million members, is one of the country's most powerful lobbying groups for gun rights. Founded in 1871, it seeks to educate the public about firearms and defend U.S. citizens' Second Amendment rights. It has directly lobbied for and against legislation since 1975. The Center for Responsive Politics, which tracks data reported to the Federal Election Commission, says the group has made nearly $23 million in direct political contributions since 1989. Gun Owners of America was formed in 1975 to protect the rights of gun owners. The group says on its website that it sees "firearms ownership as a freedom issue." 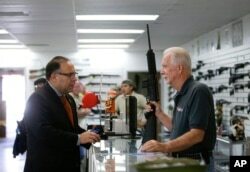 FILE - Sales associate Mike Conway, right, shows Paul Angulo a semiautomatic rifle at Bullseye Sport gun shop in Riverside, Calif., Dec. 9, 2015. One of its main efforts is to advance "constitutional carry" legislation, which would allow people to carry weapons without first obtaining a permit. "Law-abiding people shouldn't be forced to get a government permission slip to exercise their right to self-defense. No one should be treated like a criminal simply for wishing to carry a firearm in defense of themselves or their family," NAGR says on its website. The group also differentiates itself from the NRA. "Unlike the NRA, NAGR believes in absolutely 100% NO COMPROMISE on gun rights issues," it says. The Brady Campaign works to elect public officials who support gun control legislation and to increase public awareness of gun violence. FILE - Former Rep. Gabby Giffords, D-Ariz., and her husband, retired astronaut Mark Kelly, speak during the third day of the Democratic National Convention in Philadelphia, July 27, 2016. Giffords was founded by shooting victim and former Democratic U.S. Representative Gabby Giffords of Arizona and her husband, former astronaut Mark Kelly. It was originally known as Americans for Responsible Solutions. Giffords' stated goal is to "research, write and propose policies that make Americans safer and mobilize voters and lawmakers in support of safer gun laws." Giffords, who was shot in 2011, announced the formation of the group following the mass shooting of 20 children and six adults at Sandy Hook Elementary School in Newtown, Connecticut, in December 2012. Giffords and Kelly call themselves Second Amendment supporters, but are also committed to lobbying for expanded background checks, stiffer penalties on gun trafficking, and funding for research on the causes of gun violence. Everytown for Gun Safety was founded by former New York Mayor Michael Bloomberg. Formerly called Mayors Against Illegal Guns, the group lobbies for gun control legislation on a local and federal level and provides a support network for gun violence survivors. On its website, the group says, "For too long, change has been thwarted by the Washington gun lobby and by leaders who refuse to take common-sense steps that will save lives." The Center for Responsive Politics, which tracks data reported to the Federal Election Commission, says Bloomberg gave a total of $28 million to outside spending groups during the 2014 cycle to push for changes in gun control.